The process of building and remodeling a home can often seem overwhelming. Our goal is to simplify the process for clients. We have a few tools that help us do that. The most important being our process flow chart and an online project management system. 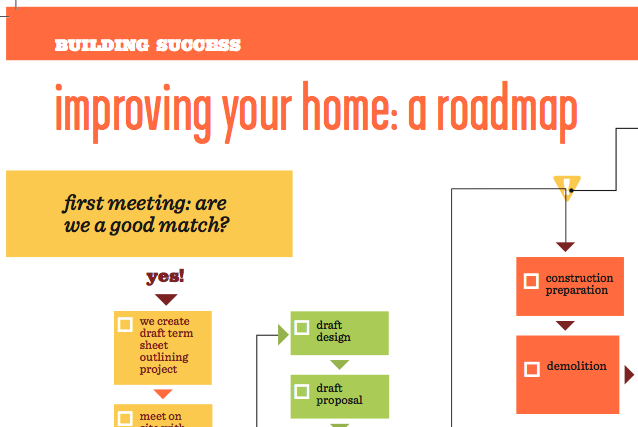 The process flowchart clarifies the remodeling and home building process. The flowchart outlines who is involved, their roles and gives an overview of the team building, planning and construction phases. We use the flowchart to start the conversation about what to expect. It also helps brings to light concerns and communication expectations. In every major building project there are countless decisions to be made. We use an online project management system to keep everyone on the same page. The project management system facilitates fast and effective communication between us, customers, vendors, and trade contractor. Our system is completely web based and provides real-time access to scheduling, change orders, documents, photos, warranty information, and homeowner selections. It is especially useful for jobs where the clients are out of town frequently and when there are a large number of materials selections to be made. Historically we relied heavily on email communications and in-person meetings. These are still a huge part of the communication process with clients but the online project management system allows us, clients, and trade contractors to quickly and easily access all of the job information in a central, web-based location.